Here comes my recipe , vegetable biryani. 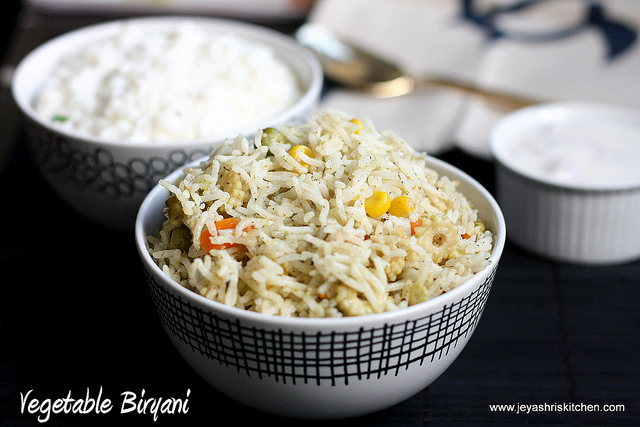 Everyone has a own style of making Biryani. I made this biryani when my uncle’s family visited here . Since my mami and periamma(mom’s sister) didn’t like garlic i tried this without adding garlic. And you know the outcome was too good and now a days i am doing this biryani without adding garlic. 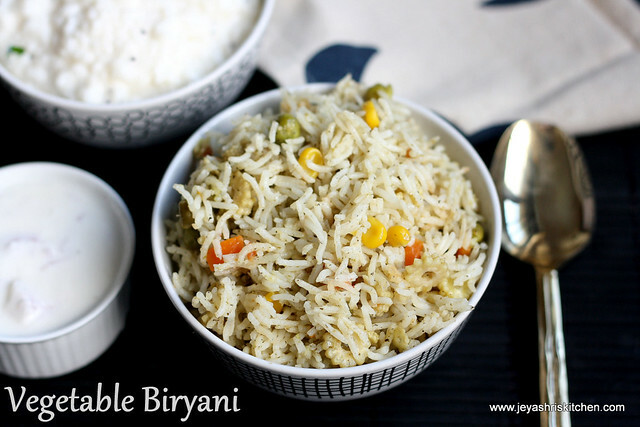 Check out my collection of Biryani pulao recipes. AND FINALLY BASMATI RICE 1 CUP. Wash and soak the basmati rice in 1and 1/2 cups of water for 20 mins. Grind the ingredients in the table no.1 into a fine paste. Cut the onions(optional) and capsicum into long thin slices. In a kadai , put 2 tsp of oil and saute the capsicum till it emits a nice aroma and keep it separately Then add the cauliflower florets and saute by adding little salt till it cooks and gives a golden brown color This will take 7-10 mins. Keep this also separately. Then again put a tsp of oil and add the thinly sliced onions to it and saute till golden brown . Now add the masala paste. Fry till the raw smell gets rid off. Cut all the veggies, except peas ,into cubes and add it to the paste. Let it gets nicely coated with the veggies. Now add the rice keeping the water aside. Fry for 2 more mins. Then transfer everything to a rice cooker or a pressure cooker and add the water. Add salt and a tsp of oil. If using pressure cooker cook till 1 whistles and simmer it for 10 minutes . Finally add the capsicum and cauliflower. Serve hot with onion raitha or any other raita of ur choice. 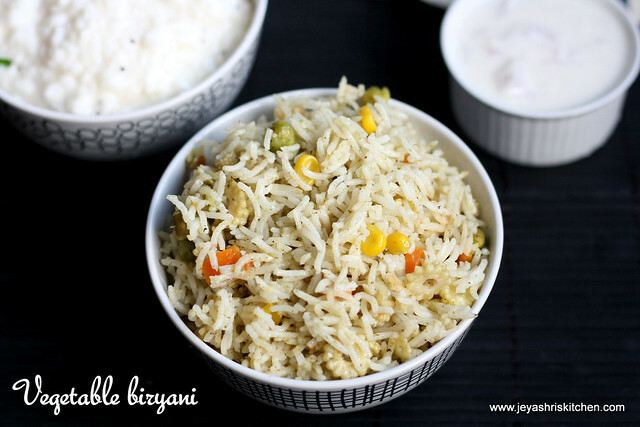 Jayashri....u should name this as Jain Biryani.....due to non usage of Garlic....thanks for sharing this....I am planning to call one of my Jain friend for dinner...will try ur version..
thank u so much purva. surely u will like this. Your presentation of dishes is awesome Jeyamma. I don't like garlic either so this biryani will be perfect for me. Will try soon. Btw, congrats on your awards. Biryani looks so tempting. Will try your version next time. Thank u meena. Try it sure u will like this. Jyothi thanks for visiting my blog. Rinku thanks for visiting and keep visiting. thank u so much lubna and malar for visiting my page. welcome A2Z to my blog and thanks for visiting me. Priti thanks a lot for the award and will collect it soon. vidhya thank u so much. Hi yummy recipe...Btw u have mentioned to add onions..can I skip? I read your rice biryani without onion & garlic recepi .... But you have used onions? ma'am, I was looking for a recipe without onion & garlic & just saw this recipe which includes no onion no garlic. But it seems that this recipe need onion. Do you have any other recipe that does not need onion & garlic.